Power Generation | Indelac Controls, Inc.
Modern power plants must be able to scale production to meet fluctuating energy demands while improving process efficiencies, ensuring process safety and reliability, maximizing profitability, and minimizing adverse environmental impact. For companies in the power generation industry reliability is paramount, so they utilize industrial grade electric actuators from Indelac to help them meet these goals. Regardless of the type of energy source that a plant uses to generate electricity – whether coal-fired, oil-fired, nuclear fission, hydropower, waste to energy plant, wind turbine, natural gas power plants, diesel power backup power, or concentrated solar power (CSP) plants – actuators are needed throughout the plant for effective valve and damper automation. Some typical uses of actuators in this industry include automated control of boiler feedwater, water for cooling towers, flue gas purification, fuel processing, chemical treatment, and steam turbine control. 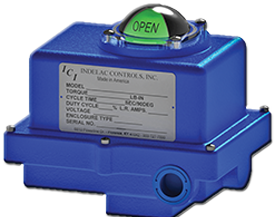 Indelac Controls, Inc. (ICI) offers a variety of actuators suitable for use in the power generation sector. Additionally, our products are rigorously tested for maximum durability and performance. Hardened steel gears, permanent lubrication, and heavy-duty sand-cast aluminum enclosures allow for maximum efficiency and longer product life in high-temperature, high-pressure, and high-vibration conditions. Optional cases are available in compliance with NEMA 4X, NEMA 7, and NEMA 9. A variety of specialized coatings are also available to provide additional protection from corrosion and environmental hazards, including epoxy coatings, electroless nickel plating, chromium conversion coatings, and anodized coatings. ICI’s versatile electric actuators are ideal for water and steam flow control in traditional power plants, or can be used in alternative applications such as adjusting solar panel orientation and controlling wind turbine movement in sustainable power generation applications. At Indelac, we understand the challenges of the power industry and have spent time perfecting electric actuators with the perfect balance of accuracy, durability, reliability, safety, and cost-effectiveness. Our focus is on designing actuators that can be easily installed in any mounting position while satisfying the highest demands for automated control. In addition, our diverse product line can meet a wide range of torque demands. Our products are backed by lifetime service and support, and our technicians offer complete support programs for retrofit, maintenance, or repair of your actuator. If you would like to know more about our electric actuators and how we can help you find the right solution for your application, contact our technical team or request a quote.